The ultimate purpose of war is malevolent: to maim, to injure, to destroy, and to kill to force one group of people to surrender to another group of people. The group of people that does the most maiming, the most injuring, the most destruction and the most killing is declared the winner, while the group of people who have taken the most maiming, injuring, destruction, and killing is declared the loser. Wars are a bad business all the way around, and the reality is that everyone involved loses, even the survivors, in ways that last a lifetime, often making those who died in an instant the most fortunate of all of those who have been in the front lines of wars. Modern warfare, which is designed not for victory or defeat, but to neutralize and contain (thanks to the development of weapons that could potentially wipe out the entire planet if actually used during wars) has, in fact, created a higher number of surviving casualties both among the military and civilian populations. Beginning with World War I, heavy artillery bombardment attacks became a common feature of warfare. As wars have progressed since then, more and more intense heavy artillery bombardment has continued to be a mainstay in fighting. However, new smaller weapons, such as IEDs (improvised explosive devices), which also create blasts, are now common feature of war. The full understanding of the physics that creates the extreme force behind blasts is fairly recent. The actual mechanics of blasts start simply: a detonation device takes something solid and transforms it into a deadly fireball. However within that simplicity, three distinct things happen. First is the blast wave, a huge wall of fixed pressure that travels outward in all directions faster than the speed of sound (blast waves will wrap around any objects and buildings in its trajectory). Second is the blast wind, which fills the void behind the wall of pressure and takes with it any objects it encounters. The most overtly destructive part of the blast, the blast wind is capable of heaving with tremendous force anything that lies in its path. Third are the residual effects, which include fire and toxic gases, that can burn, poison and suffocate anyone who is in range of the blast. There are a multitude of effects that blasts have on the human body and they are significantly more complex than the actual blast. For people who have been in blasts, the experience is described as physical overpowering and all-encompassing. Most people, including military personnel, cannot remember the moment of impact, but often describe the characteristic flash of blinding light and ear-splitting sound. For the minority who do remember the impact of the blast, they remember it as an extremely violent assault on their entire bodies. The residual mental effect of these blasts on the soldiers who are near them, but who survive them, has been evident from the identified shell shock of World War I, which Wilfred Owen described in his poem, Mental Cases (“-These are the men whose minds the Dead have ravished.”), to the post-traumatic stress disorder first identified in the Vietnam War and lasting through all the wars being currently waged around the globe. The military has diagnosed the immediate effects of these blast wounds as traumatic brain injuries. Over 350,000 military personal have been given this diagnosis over the last 15 years, although the actual number is undoubtedly significantly higher. The expectation with a concussion resulting in single traumatic brain injury is that the part of the brain that has received the blow will recover with rest and rehabilitation and the person will continue on with a relatively normal life. But these soldiers didn’t and couldn’t go on with a normal life. The effects of their exposure to a blast force of the magnitude present in the weapons of war did and have just lingered and worsened. The symptoms are always the same: horrible headaches, great difficulty concentrating, serious sleep disorders, progressive memory problems, advancing cognitive impairment, suicidal depression and extreme anxiety. Until recently, the medical field has attributed the lingering effects of shell shock and PTSD, not to permanent neurological damage, but instead to emotional and psychological defects, with the idea that some soldiers were just emotionally and psychologically weaker than other soldiers, and, therefore, more susceptible to lingering effects after their military service ended. In 2012, however, neuropathologist Daniel Perl found something he’d never seen before (Dr. Perl has a career that has focused on examining the neurology of dementia and other neurogenerative diseases that has spanned forty years and included 20,000 brains) when he was examining the brain tissue of a military veteran who survived an IED explosion five feet away from him in 2009, but who died as a result of a drug overdose two years after coming home. The damage to the brain tissue was not consistent with the neurological damage drug abuse and drug addiction causes. Nor was the damage consistent with the kind of neurological damage usually seen in traumatic brain injuries (TBIs) and CTE (chronic traumatic encephalopathy). 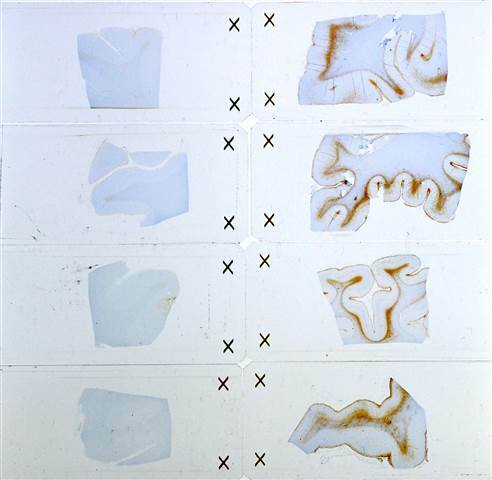 What Dr. Perl saw under the microscope in the folds and crevices of the brain looked like brown dust, which was a distinctive pattern of tiny scars within the brain in the areas responsible for sleep, cognition, memory, and emotion, resulting in malformed proteins and twisted axons. Dr. Perl was already in Washington at the request of the Pentagon (which offered their brain collection as a starting point to the neuropathologist and his team) to conduct a systematic study of blast-injured veterans, so he and his colleagues began a concentrated effort to uncover what made blast TBIs similar and how those injuries affects the lives of soldiers after the war, for them, was over. Blast traumatic brain injuries are significantly different from the brain injuries sustained when a person suffers a concussion. 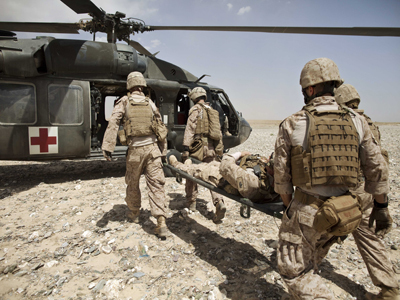 What Perl and his team of researchers found as they continued the study of Pentagon’s blast-injured brains was the exact same pattern of “brown dust” damage of a plethoria of tiny scars in exactly the same areas of the brain. Even more surprising were the autopsies of two soldiers who had died from other injuries a couple of days after being in the area of a blast explosion. Dr. Perl saw in their brains the beginnings of the same pattern of clustered tiny scars in exactly the same areas of the brain that he saw in advanced stages in the brains of veterans who had lived several years after their exposure to a blast explosion. The bottom line is that these blasts of war leave not only lifelong physical scars, emotional scars, mental scars, but also irreparable neurological damage, resulting in scars that can’t be seen, but which haunt and destroy – suicides in the short-term and dementia in the long-term if they survive long enough – the human lives we as countries cavalierly send to the front line of defense for what are often ignoble reasons: personal vendettas, greed, power, and colonization in one form or another, and then reject, ignore, and dismiss when and if they come home.